Vulcan 3100 hammer installing piles for Exxon’s Hondo platform off of Santa Barbara, California. In 1752 Bishop Erich Pontippidan noted that “The North Sea has a curious property. In addition to its salinity it also possesses oiliness. It is likely that here or there the sea, just as the earth, ejects oil flows, or streams of petroleum, naptha, sulphur, coal tar and other bituminous and oily juices.” Similar things were noted off of California, without the offshore drilling that is supposed to be the sole cause of this. Vulcan offshore hammers could be found in places other than offshore. 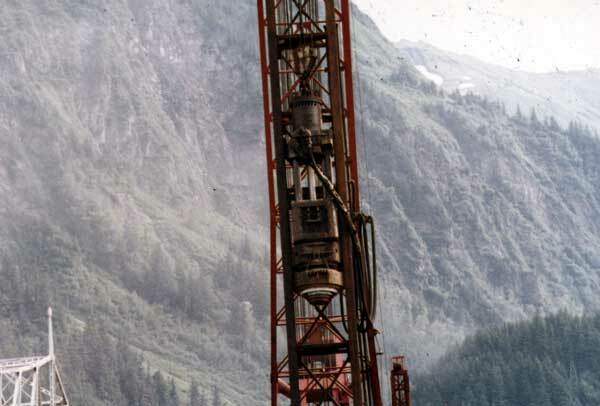 This 560 is installing pipe piles for a bridge in Juneau, Alaska in the late 1970’s. The major differences are a) the leaders and b) the mountain in the background. A spectacular photo taken from a helicopter shows a Vulcan offshore hammer at work from a J. Ray McDermott barge in 1976. The barge layout is typical, with the crane on one end, deck in the middle, and heliport on the other. A supply barge and tugboat are pulled up on the barge’s starboard. The platform is off the bow of the barge, but it could also be off of the beam as well. 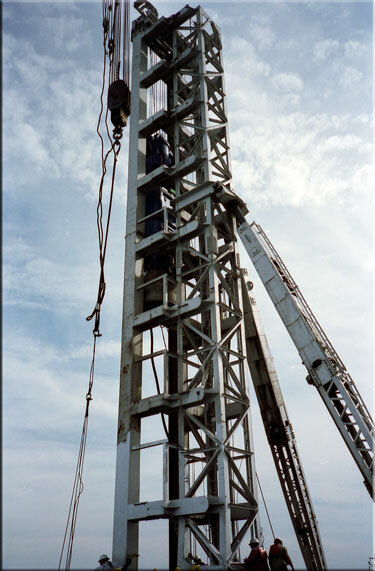 Vulcan 560 driving piles for a simple four-pile platform; Santa Fe was the contractor. This photo is interesting in several ways. 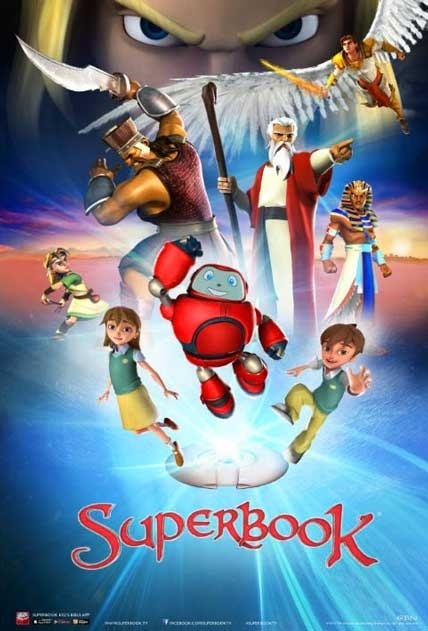 It shows how the platform is used as a template. 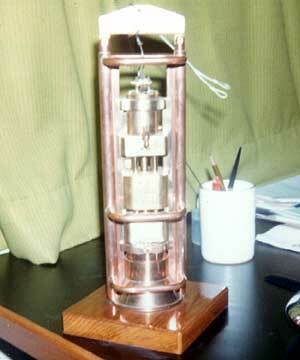 It also shows the batter of the piles; this was typical offshore. The operator is leaning the hammer properly so that the wear of the columns is more evenly distributed. 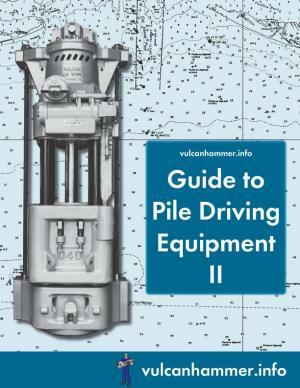 Notice too the pile partially driven on the right; the flared pile head is due to premature refusal and brooming during driving, a testament to the punishment both hammer and pile experienced offshore. Another view of Santa Fe’s Vulcan 560 at work. This wasn’t the ideal way to lean the hammer, but one of the things that make Vulcan hammers popular was their ability to perform when misused or mishandled. 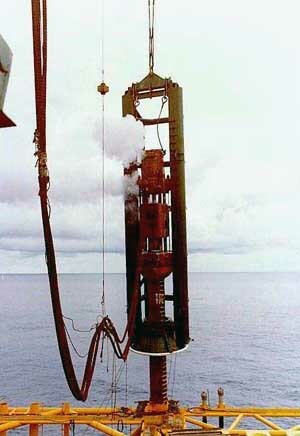 Steam hammers weren’t the only type of pile driving equiment Vulcan sent offshore; this Vulcan 4600 vibratory hammer is shown driving piles into the Gulf in the early 1990’s. 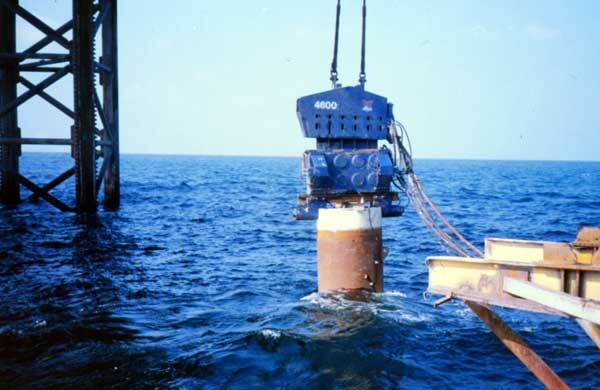 Vibratory hammers were an excellent choice in certain applications, and they were naturally adept at underwater driving. 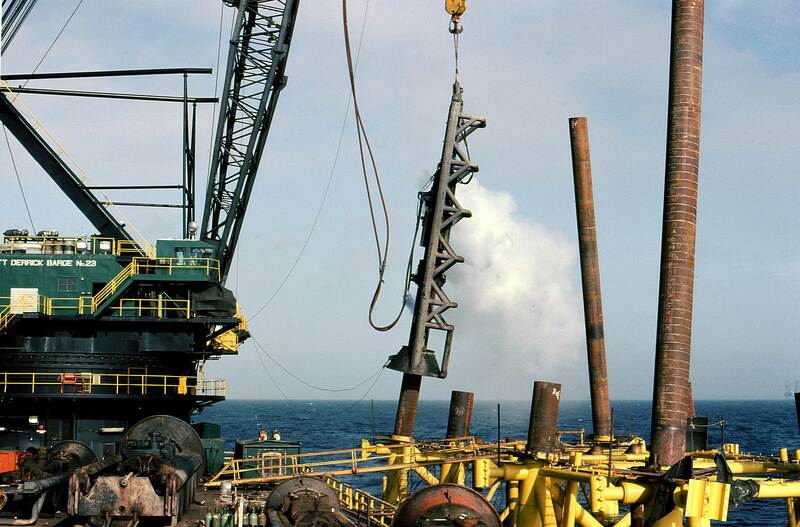 Offshore Hammer, Onshore Style Leaders: the last Vulcan offshore hammer produced, a 340 for the Venezuelan oil company PDVSA, starting up in 2000. 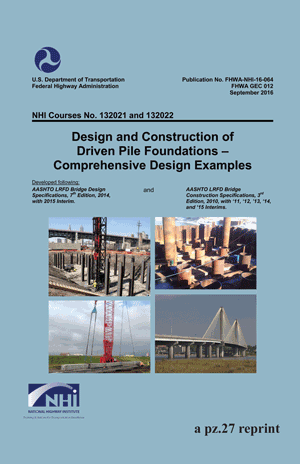 Note that the leaders are fixed ones: this is to facilitate driving the large concrete cylinder piles used for platforms in Lake Maracaibo. 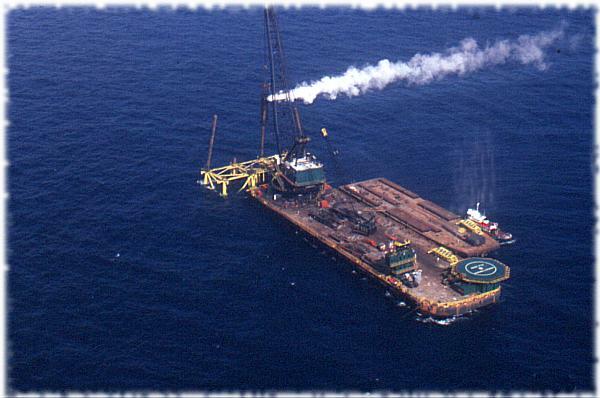 Vulcan: The Offshore Experience A spectacular photo taken from a helicopter shows a Vulcan offshore hammer at work from a J. Ray McDermott barge in 1976. The barge layout is typical, with the crane on one end, deck in the middle, and heliport on the other. A supply barge and tugboat are pulled up on the barge’s starboard. The platform is off the bow of the barge, but it could also be off of the beam as well. 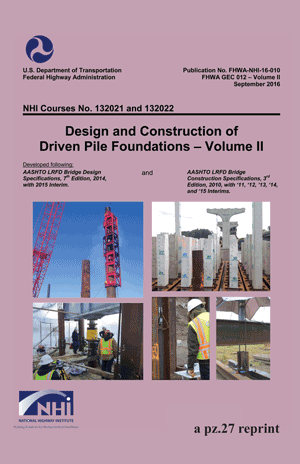 Vulcan 560 driving piles for a simple four-pile platform; Santa Fe was the contractor. This photo is interesting in several ways. It shows how the platform is used as a template. 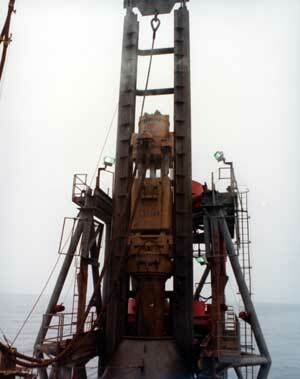 It also shows the batter of the piles; this was typical offshore. The operator is leaning the hammer properly so that the wear of the columns is more evenly distributed. 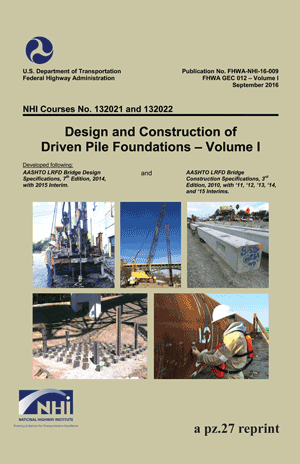 Notice too the pile partially driven on the right; the flared pile head is due to premature refusal and brooming during driving, a testament to the punishment both hammer and pile experienced offshore. 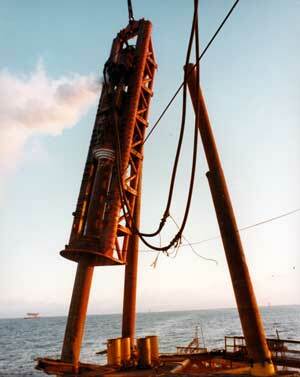 Vulcan 5100 hammer driving pipe pile in the Gulf of Mexico. This photo graced offshore literature in the late 1970’s and again in the 1990’s. The deck of an offshore derrick barge was a busy place. This was taken on a McDermott barge, showing the hammers along with a good deal of other equipment, ready to start installing piles. Another view of Santa Fe’s Vulcan 560 at work. This wasn’t the ideal way to lean the hammer, but one of the things that make Vulcan hammers popular was their ability to perform when misused or mishandled. 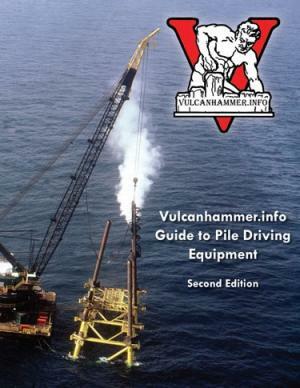 The Vulcan 3100 hammer, aligned on the pile and ready to drive. The 3100, with its 3′ stroke and 100,000 lb. ram, was Vulcan’s largest hammer when it was made, but the 560 soon proved that 300,000 ft-lbs of energy was more easily developed (and in some ways more effective) when a 5′ stroke was used with a lighter ram to develop the same energy. Not all Vulcan hammers in the field were full size. This scale, working model of a Vulcan 200C was mode of brass by Frits Teerling, Brown & Root’s redoubtable equipment superintendent. 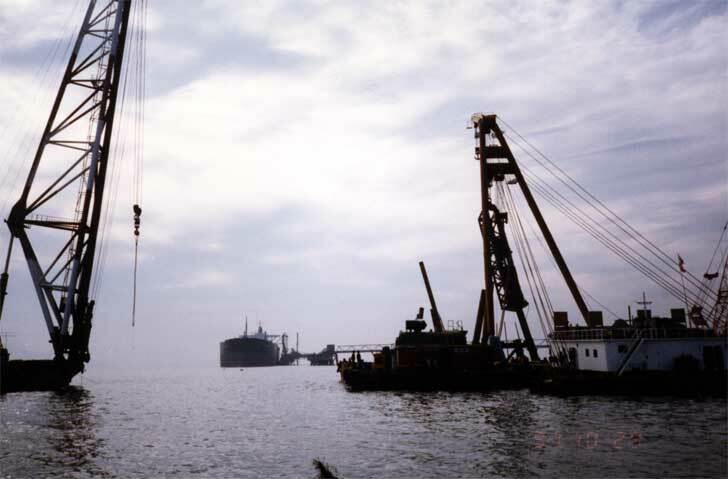 Another offshore hammer moving onshore: the Korean contractor Daelim drives piles with a Vulcan 560 just off of the Korean coast in October 1991. 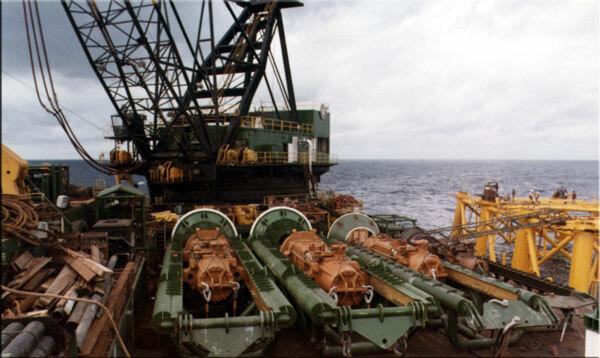 The deck of an offshore derrick barge was a busy place. This was taken on a McDermott barge, showing the hammers along with a good deal of other equipment, ready to start installing piles. Another Vulcan hammer in action for McDermott, this time a 3100 on McDermott’s DB (derrick barge) 23 in February 1976. The hammer is a Vulcan but the leaders are McDermott’s own design. This photo graced the Australian Avenue office wall, deservedly so.